Bill was born in 1950 in Hamilton and was raised in the North End and Dundas. He attended McIlwrith Public School and Parkside Secondary School in Dundas after which he went on to study, Sciences, at McMaster University. In 1976, he married his sweetheart, Patricia, and they were blessed with the birth of their only son, Adam. Bill is now the proud Grandfather of two beautiful and darling granddaughters. Bill's working career has spanned a wide variety of different occupations, ranging from running his own paint & wallpaper store with his father to operating a submarine sandwich shop to working at Dofasco. After leaving Dofasco he began his current career with Primerica Financial Services in 1989, with the leadership traits he possesses Bill has become a Regional Vice President and Branch Manager with Primerica Financial Services, earning his own franchise office in Hamilton. Bill's hobbies other than Masonry, have earned him a black belt in Karate in which he also spent years teaching youngsters that discipline of the Martial Arts. He coached Softball in the Hamilton area for about 19 years, he is a model railroader and an avid golfer, one of his dreams would be to play on the Pro Golf Tour. Masonically, Bill was initiated in Valley Lodge A.F. & A.M., No. 100 in Dundas in May 1979 where he has always remained an active member, obviously. 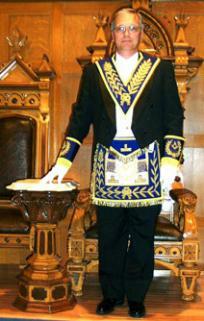 He was elected as Worshipful Master of Valley Lodge on 4 different occasions. He is also an active member of the three bodies of the Scottish Rite in the Hamilton Valley as a 32nd degree Scottish Rite Mason. He was made an Honorary member of The Electric Lodge A.F. & A.M. No. 495 where he has the opportunity to demonstrate one of his many talents, as he was the Organist of the Lodge and was elected and served as Worshipful Master in 2006.